Hulu is now streaming all five seasons of Dharma & Greg as of Frebruary 13th, 2019. This is the first time the show has been available to watch since it wrapped up its fifth season in 2002. Only the first season was released on DVD a few years ago, so fans are very excited that thye can now binge watch all five seasons and relive the laughs. Visit Hulu to start watching! Jenna was recently featured in Untitled Magazine… read the article HERE. Jenna has appeared on AMC's Talking Dead with Chris Hardwick three times since joining the cast of Fear the Walking Dead… on Sundays, September 23rd, September 2nd, and March 14th. The show airs live each week immediately after The Walking Dead and its spinoff, Fear the Walking Dead, and features a recap of the last episode, chats with actors & producers, & questions & comments from viewers. Go to AMC.com to watch full episodes of Talking Dead. Exclusive episodic and behind-the-scenes photos from Fear the Walking Dead Season 4 on EW.com. 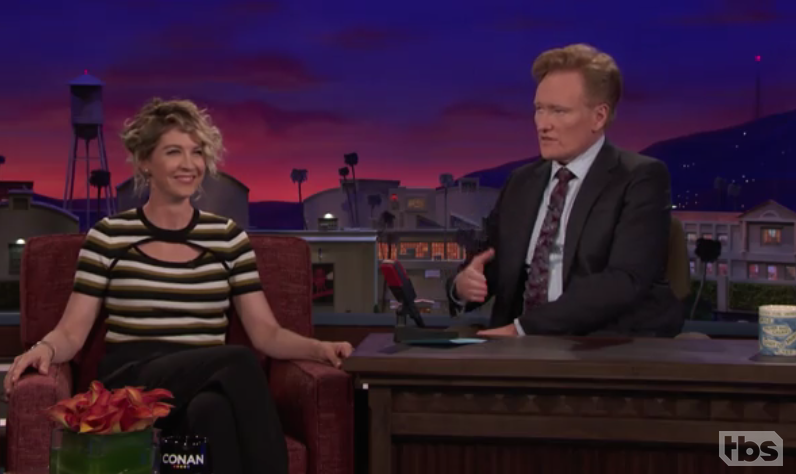 Jenna had fun sitting down with Conan O'Brien on May 3, 2018. 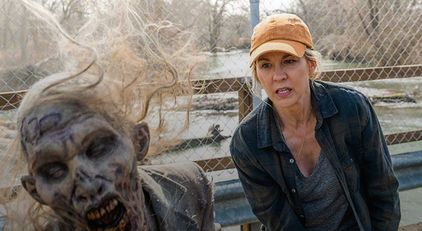 Watch interview and behind the scenes footage of Jenna from the episode of Fear the Walking Dead in which her character Naomi is introduced; and get a look at how the cast and crew pulled off the walker-filled oil tank scene. Jenna joined the cast of Fear the Walking Dead as a series regular for its fourth season, which premiered on AMC this past Sunday, April 15th. Fear of the Walking Dead, a prequel to AMC's popular The Walking Dead, marks the sign that the apocalypse has begun. Jenna's character was introduced during the second episode of the fourth season. Vanity Fair published an article yesterday, May 13, 2018, "Inside Fear the Walking Dead’s Epic New Love Story" about the Fear the Walking Dead episode entitled "Laura." Watch The Season 4 Teaser Trailer Below! Jenna has joined the cast of Fear of the Walking Dead, a prequel to AMC's popular The Walking Dead, as a series regular for its fourth season, which premieres on AMC on April 15th at 10pm/9C, right after the season finale of The Walking Dead. Jenna has joined the cast of Fear the Walking Dead as a series regular for its fourth season. Details of Jenna's character are being kept under wraps. 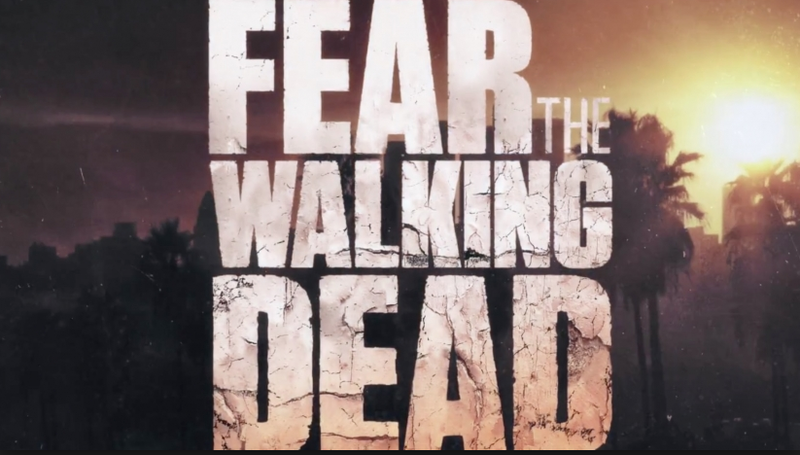 Fear of the Walking Dead, a prequel to AMC's popular The Walking Dead, marks the sign that the apocalypse has begun. Reports of a rapidly changing world for unknown reasons underscore this gritty drama, which begins its fourth season on Sunday, April 15th. The show airs on AMC at 10pm/9C. Jenna received the Spotlight Award at the fifth annual aTVfest, held this year on Feb. 2-4 in Atlanta, Georgia. Kicking and Screaming with Jenna and Bodhi Elfman, the show on which Jenna and her husband Bodhi talk about their marriage, lives, annoyances, and much more, has just joined the Nerdist Podcast Network! If you have not heard or seen an episode yet, all episodes (both audio and video) can be found on iTunes - and make sure to subscribe to the podcast in iTunes so you never miss a new episode! You can also find us on Nerdist.com and Sticher.com. Be sure to follow @JennaElfman, @BodhiElfman and @KickingElfman on social media (Twitter, Instagram and Facebook). Jenna to co-host the TODAY show this morning from 10-11am with Hoda Kotb! Jenna will be co-hosting the TODAY Show with Hoda Kotb TODAY, Monday, October 12th, from 10-11am on NBC! She visited the TODAY show just last Thursday while in New York promoting the opening of her new film Big Stone Gap and sat down with the TODAY team to discuss the film and the amazing experience she had making it. She then headed to the small town of Big Stone Gap, Virginia, where the film was set, for a whirlwind celebration of the film's premiere. Now back in New York and back on the TODAY show, Jenna will be filling the shoes of host rather than guest! Tune in this morning to watch her and Hoda for what is expected to be a VERY FUN hour of television! Dizzy Feet Foundation's Celebration of Dance Gala this Saturday! Jenna & Dizzy Feet's Co-President Nigel Lythgoe enjoying a dance together at the 2013 Dizzy Feet Foundation Gala. The Dizzy Feet Foundation’s Celebration of Dance Gala annual fundraiser is happening this Saturday August 1, 2015 at Club Nokia in Los Angeles, California. The Celebration of Dance Gala serves to raise funds to further the DFF's mission to support, improve, and increase access to dance education in the United States. YOU can join Jenna in helping this great foundation by buying a ticket to attend this great event - one that is sure to be THE dance event of the summer! General Admission tickets are available to experience this extraordinary night of dance (gala performance only), ticket prices starting at $75 and available for purchase ONLINE or by phone at 1-888-9-AXS-TIX (1-888-929-7849). VIP tickets and sponsor levels are also available for tables to attend the Dinner, Performance & Post-Performance Reception. CLICK HERE for a full listing of VIP ticket prices & Sponsorship Levels, or to purchase these tickets online. As a classically trained dancer and a member of the board of directors of the Dizzy Feet Foundation, Jenna is very passionate about dance and the DFF's goals to sponsor, fund, and support dance education programs which expose children in low-income areas to the lifelong benefits of dance education and to provide scholarships to talented students studying at accredited or nationally regarded dance schools/studios/institutions. For this year's Gala, the phenomenal performance list includes Body Traffic, Academy of Villains, Joffrey Ballet dancers Fabrice Calmels & Victoria Jaiani, Cyrus “Glitch” Spencer & Sara “Lil Mini” Pheonix, Lula Washington Dance Theatre, Dancer’s Inc. and Kim Eung Hwa Korean Dance Academy. The event will also feature performances from DFF Community Program recipient San Pedro City Ballet, and there will be a special piece created by Stacey Tookey especially for the event to be performed by DFF Scholarship recipients. Jenna had a great time hanging out at Access Hollywood Live this week discussing a myriad of topics relating to her life of dance, her career, and her 20+ year marriage. She talked about her dance roots as a classically trained ballerina, her current position as a board member for The Dizzy Feet Foundation, as well as her "Kicking and Screaming" podcast that she and her husband Bodhi record in which they discuss their marriage and how they survive it by kicking, screaming and laughing through the craziness. She also mentioned the upcoming dance education fundraiser she will be attending next Saturday. You can join Jenna at this annual fundraiser, The Dizzy Feet Foundation’s Celebration of Dance Gala, as it takes place on Saturday, August 1, 2015 at Club Nokia in Los Angeles, California. It is sure to be THE dance event of the summer! General Admission tickets are available for the gala performance only. To experience this extraordinary night of dance, ticket prices start at $75 and are available for purchase ONLINE or by phone at 1-888-9-AXS-TIX (1-888-929-7849). VIP tickets and sponsor levels are also available. CLICK HERE a full listing of VIP ticket prices & Sponsorship Levels, or to purchase these tickets online. Jenna was honored to attend the screening of her upcoming film with Whoopi Goldberg and Ashley Judd, Big Stone Gap, at the Bentonville Film Festival on May 8, 2015 in Bentonville, Arkansas. The film won the "Best Ensemble Film" award at the festival and is set to be released in theaters this fall on October 9th. Big Stone Gap's award for "Best Ensemble Film" at the Bentonville Film Festival. New "Dharma & Greg" Season 2 DVD just released! The wait is over! After many years of anticipation, fans of Jenna's popular sitcom "Dharma & Greg" finally have the opportunity to purchase "The Complete Season 2" of the show on DVD! This is great news since, up until now, only Season 1 (out of the show's five season run) had been released on DVD previously. Jenna won the Golden Globe Award for "Best Performance by an Actress in a Television Series, Musical/Comedy" for her portrayal of Dharma during this second season of the show. Regarding the DVD's release, Jenna tweeted to her fans on January 12th: "Hey DHARMA & GREG fans! Now you can buy Season 2 DVD on Amazon!!!!! YAYYYY!" and provided this Amazon link to the DVD. Jenna's feature film, Big Stone Gap was written and directed by Adriana Trigiani (also the author of the N.Y Times bestselling novel, Big Stone Gap, the book the film was based on), also stars Ashley Judd, Patrick Wilson, Whoopi Goldberg, and Jane Krakowski. It was shot on location in and around the actual town where the story takes place, a small mining town called Big Stone Gap, Virginia. Jenna attended the premiere at the Virginia Film Festival in Charlottesville, Virginia on Nov. 6th. It showed at the Paramount Theater to a sold-out crowd of 1,100 as the first film of the 2014 festival. Jenna, alongside fellow cast members Ashley Judd, Patrick Wilson, and Jasmine Guy, participating in a press conference before the premiere and at a question-and-answer session afterward, all shared how welcomed they’d felt when filming in Wise County. Jenna filming Big Stone Gap on location in Virginia. While filming, Jenna took many photos of her fun adventures filming on location, goofing around with fellow cast and crew members, and visiting interesting places and encountering many smiling faces around town. She chronicled her experience on social media and even had her two boys along for the ride art of the time, even spending Halloween on location there. Needless to say, being a part of making this film was a truly an unforgettable experience for Jenna. She loved meeting, taking photos with, and getting to know the wonderful people in all the areas they filmed, and will treasure her time there always.